These photos were taken while filming ‘All Creatures Great and Small’. 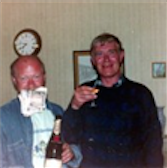 We were filming at a horse race stables in the Yorkshire Dales, we had a sure fire tip from the Head Lad, we all won and took the local bookmaker for £1000. 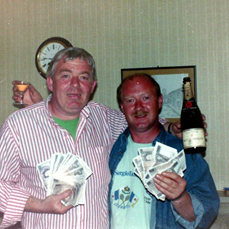 Those are £50 notes by the way, there were some very sore heads in the morning. Terry Ford the guy in the dark jumper, has passed away, the other guy is Stan Morgan, ( in stripped shirt ) I think he has passed away too. I worked with these guys 30 years ago at Pebble Mill. Wonderful experience, great bunch of guys – Big Sid, Jimmy King, Carter, Kit, Bobby Fulford, to name but a few. I have no doubt most of them have now passed away. Life is transitory at best. Genuinely loved the Mill. I went back a few years ago – only to find it had been demolished. Great sadness.